Make your outdoor space great again. Enjoy your outdoor space more with fresh fixtures for entryways, patios, walkways and landscaping. Get out of the dark. There was a time when an overly bright floodlight shining down from the eaves or from up in a tree (and perhaps directly into the eyes of you and your guests) was considered acceptable outdoor lighting. These days, homeowners know better and expect more. 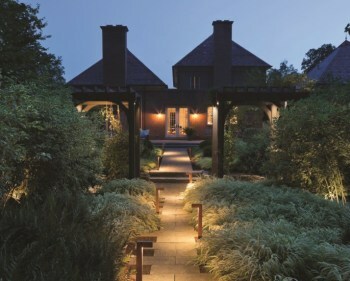 Outdoor lighting options are now more efficient, effective and attractive. 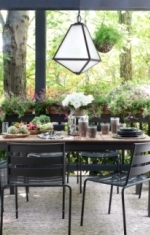 Homeowners often install sconces, pendants or chandeliers in outdoor dining and gathering spaces, path lighting for safe passage and ambiant tree lighting for evening ambiance. 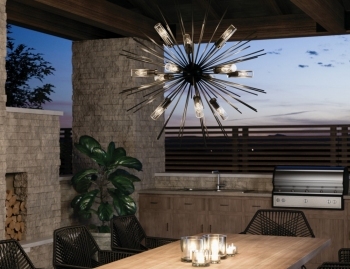 These and many more outdoor lighting options are offered at ALA-member showrooms. Don’t forget lighting’s close companion, the ceiling fan. 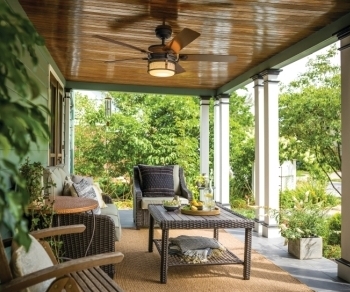 The addition of a ceiling fan with a light in an outdoor living area can immensely improve your enjoyment of that space. Lighting magazine has it all. Whether for indoors or out, the right lighting sets the tone and determines how a space is used and enjoyed. Where to start? 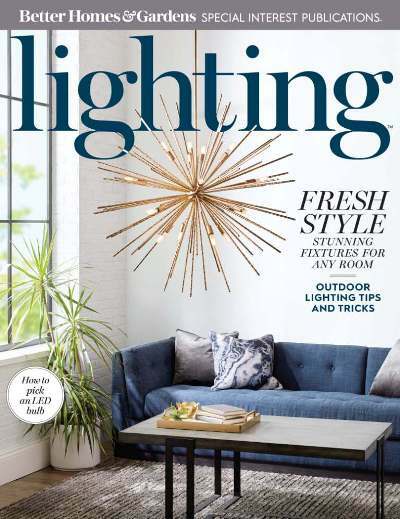 Lighting magazine has all the latest fixtures and design trends. 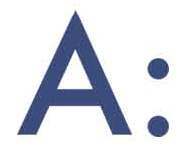 Once you find the look you want, take your ideas to an ALA-member lighting showroom. There, a trained expert can work with you to get the perfect lighting to create a beautiful, functional and efficient space for you and your family to enjoy for many years. I found a fixture I love, but am not sure it can be used outside. 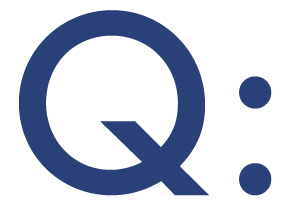 How can I tell if a fixture is safe for outdoor use? Check the fixture label to see if it is rated for damp or wet areas. A UL damp rating means the fixture may be used outdoors as long as it does not have contact with moisture. A UL wet-rated fixture can be used anywhere outdoors or indoors. A UL dry-rated fixture may only be used in areas not directly exposed to excessive moisture and water. Stop by an ALA-member showroom to see a wide selection of stylish and efficient outdoor-rated fixtures.